David Moran is the elder statesman as Kerry start out on the championship road today. REWIND TO A Saturday in March 2007 in Kilmihil. 25 years since Kerry’s football world was famously rocked by Clare, David Moran witnessed a repeat act. He was fresh off a multi-talented minor team that had lost out to Roscommon in their pursuit of All-Ireland honours the previous September. But his first foray into the U21 arena was to prove unsuccessful. Future All-Ireland winners Brendan Kealy, Shane Enright, Johnny Buckley, Kieran O’Leary and Tommy Walsh were amongst his colleagues that day yet Kerry were grounded at the first hurdle in Munster by Clare. “It’s still stuck in the memory,” says Moran ruefully. Over a decade on and it still plays on his mind prompting him to treat Clare challenges with a wariness. The latest obstacle presents itself in today’s Munster semi-final in Killarney. For Moran, the war around the middle is something to steel himself for as he goes up against his old UL college mate Gary Brennan. “Ah yeah (he’s) a class act. He’s a phenomenal athlete, he’s a fantastic footballer. I was delighted to see him getting such recognition nationally but also a chance to play with the International Rules. 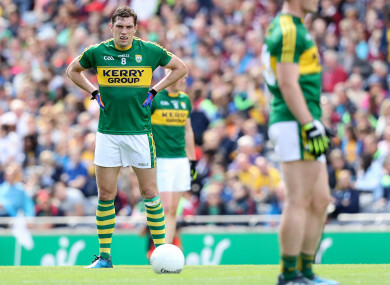 Moran has had his share of challenges to face in search of personal consistency in the Kerry ranks. He made his championship bow in 2008 at a time when the Kerry dressing-room was packed with illustrious figures and decorated footballers. Then in 2011 up in Monaghan in a league game his cruciate snapped in innocuous fashion. That season was a write off and as he attempted to mount a comeback in 2012, the knee buckled once more in a club session with Kerins O’Rahilly’s. Same injury, same bleak prognosis. Two seasons consigned to the scrapheap, he faced into 2013 with renewed enthusiasm until a freakish accident in a challenge game that May against Laois resulted in him tearing half the retina inside his right eye. There were grave concerns about his vision ever being the same, thoughts of football placed firmly on the back burner. But his luck changed, his eye mended and he rebounded. Finishing 2014 with an All-Ireland medal and an All-Star award felt like a testament to his perseverance and graft. “There’s no fun being injured. It’s all isolation, you’re doing rehab on your own in the gym. It’s no fun in that like. “The reality of life is you have to do it, whether you never want to play football again because you need it for life. You need it if you want to play five-a-side, go for a walk or a run or whatever. You need to get your knee right. “You need to come back from any of those injuries just because you’re early thirties or late twenties and you’ve the rest of your life to live. His rehabilitation during those seemingly interminable periods on the sidelines was not just rooted in a desire to live a healthy life. The goal of playing for Kerry again guided him as well. “You still need something to drive you on to do the extra sessions. You’re not doing the same rehab as someone who doesn’t play sport. You’re doing like probably four times more sessions. “You’re more intense, you’re watching your diet, you’re doing everything that you’re told might help as opposed to getting the surgery, doing a couple of days a week. “If your aim is to go back playing, you’re going to do everything you physically can to get there. Look injuries are part and parcel of every sport. “Your heart would break for some of the guys missing out on the Grand Slam or the different things with rugby, soccer or whatever. The flipside is the last few seasons, getting to enjoy establishing himself in the middle of the field for Kerry. He turns 30 later this month and looking around during Kerry team photos, he gets a sense of his different standing. He’s the oldest player named to start for Kerry today. There’s seven newcomers pitched into the white heat of championship. Moran is one of only six players selected from the 2014 All-Ireland winning starting side. Changed times in the Kingdom. “I definitely feel the transition there in the last few years but it’s great. It brings great freshness to it. Half the time you’re pinching yourself saying this is mad. He is mindful of the transition. Watching Sean O’Shea or David Clifford burning it up in the minor grades naturally creates wild excitement amongst Kerry fans about what is potentially in store at senior level. “They’re all young guys but on the field you need them to be mature guys and they have been but the proof of that now will be Sunday whether we can transition from very good minors to senior footballers. “It’s not as easy as just going through the motions. We went through a period there from 2000-2011 when you were in nine All-Ireland finals and you’d very little minor success as the root of that. “So it doesn’t mean anything. You’re hoping these guys can step up to the next level and we’ll give them as much support as we can. You see Man United win the Youth Cup and all of a sudden you want everyone to come in and play. “Or the Ireland U20′s do well in the World Cup, you want them all in. That’s natural. People just want success, people want to see the next Maurice Fitzgerald or Gooch or whoever. Off the field life has shifted as well. After years in college in Limerick and working in Cork, Moran is now at home in Tralee as a partner in accountancy firm, Casey Stephenson. It’s a shorter spin to training now, the Kerry players ushered in the doors of the gleaming new facility in Currans of late. “It’s fantastic, it’s a great facility, so we’re lucky to have it. I didn’t think I’d be training in it. I thought I’d be gone by the time it came in! “But then all of a sudden it was open and I was delighted. It’s great for me given that we’re Tralee based. Lads who are based in Cork probably aren’t getting the same benefit out of it in terms of the gym or whatever. It’s brilliant. Email “Memories of a Clare upset, the road back from cruciate damage and Kerry's new wave”. Feedback on “Memories of a Clare upset, the road back from cruciate damage and Kerry's new wave”.